L'observation des baleines et la visite du glacier de Mendenhall sont deux des activités les plus populaires autour de Juneau. Vérifiez-les tous les deux sur votre liste lors de cette visite combinée de 5 heures qui comprend des heures de départ flexibles et un transport aller-retour depuis le mont. Tramway Roberts, le rendant idéal pour une excursion à terre ou un voyage rapide. Faites votre chemin vers le mont. Tramway Roberts à l'heure d'enregistrement choisie (l'excursion commence 15-30 minutes plus tard). 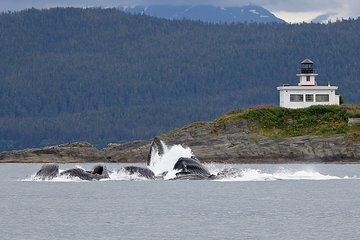 Rendez-vous avec votre guide pour une balade informative à travers Juneau, en direction du port de plaisance, où vous monterez à bord d'un bateau d'observation des baleines pouvant accueillir 24 ou 49 passagers, doté d'une cabine chauffée, d'un pont spacieux et de larges fenêtres permettant d'observer la faune. Avec l'aide de votre guide, observer les baleines pendant votre croisière de deux heures est un jeu d'enfant. Le capitaine annoncera une observation et ralentira le bateau afin que vous puissiez obtenir la photo parfaite du pont, et un naturaliste à bord pourra vous fournir des informations supplémentaires et répondre à vos questions concernant la vie sauvage de l'Alaska. Ensuite, continuez vers le Mendenhall Glacier Visitor Center. Profitez de votre temps libre pour prendre des photos ou vous promener dans les sentiers de randonnée et de nature, en choisissant une heure de départ flexible et mieux adaptée à votre emploi du temps. Une navette part du glacier vers le mont. Tramway Roberts toutes les 30 minutes, ce qui en fait un circuit parfaitement adapté aux horaires serrés. Remarque: les visites de l'après-midi sont inversées: le premier arrêt est le glacier de Mendenhall. Il comprend l'heure de prise en charge prévue et est suivi d'une visite de deux heures aux baleines. Had an excellent time looking for whales. Got to see quite few surface, spout and then dive again. We had 5 whales around the boat. The last whale we saw surfaced and was headed directly toward the boat before he dove under. Captain Jordan did a fantastic job. Christy and the other naturalist did a great job explaining about what the whales were doing and how to identify them by their tails. Mendenhall Glacier wasn't nearly as impressive as Hubbard, plus it was raining. Did however get to see a cinnamon colored black bear with her 2 cubs. Mendenhall was very impressive, and the visitors center was educational. But most amazing was the whale watching. 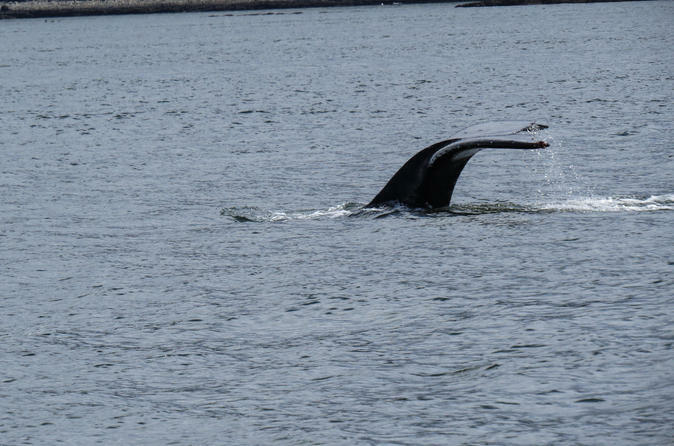 The very enthusiastic tour guides were able to recognize the individual whales by the markings on their tales. They had a book of photographs of each of the regulars, with their histories and stories. It was so peaceful watching the whales, enjoying the mountains and the water - definite must-do! We had a great trip on a beautiful warm day. We saw humpbacks, Dall's porpoises and many eagles. We learned a lot from the naturalist and the driver. They were great, the boat was comfortable and we had a good time. Much cheaper than the Princess tours offered. It was cold and rainy on the day we went, so it affected the tour experience, but we only saw a 2 or 3 whales and only the the tails for a short time. The guides were really great, but I could not hear over the sound of the boat. If the weather had been nicer then it would probably have made the experience better and we were unlucky that we didn't see many whales. Really a great trip and I highly recommend Juneau Tours. We did the combo whale watch and Glacier tour which worked out great through Juneau. The whale watching part was great, we saw lots of whales and the guides were entertaining. There were a lot of boats out in the same general area, so how many whales you see is more about luck of the day...then which boat you are on. Guides on Juneau were great, but I heard good things from other cruise passengers about guides elsewhere. The difference we saw with Juneau was a less structured approach at the Mendenhall Glacier Park. They had buses arriving/departing every half hour which allowed you to stay for as long or short a time as you wanted. The glacier park has a lot of trails to explore, so we wanted a little more time there. People on other tours complained that they were only allowed an hour total at the park, which is not enough time for anything more than the gift shop and observatory, display area. With Juneau Tours we made our own timetable allowing for time to take the trail to the waterfall an a few other easy trails as well. One word of warning, you may want to pack some extra snacks - Juneau Tours gave out granola bars and water on the boat, but no food is available at the Mendenhall Glacier National Park at all. I wish I could post the video... too large... this tour guaranteed whale sightings and it could not have been any better! Must see. My appreciation once again to VIATOR for their incredible offerings. We booked all 3 land excursions during our Holland America Alaska Cruise with VIATOR instead of the cruiseline, which is always risky. Everything went without a hitch and we saved a lot of money in the process. Very organized, nice boat, great trip! We saw bald eagles and about 8 whales on our recent trip. The staff was VERY knowledgeable about the area and their whales. They recognize each whale by the colors/design on its tale, and call them by name. Our bus driver's name was DL, captain of the boat was Steve, and the staff on the boat were Mark and Olivia. All were helpful, courteous, and made the trip well worth it. After the whale watching, the bus dropped us off at Mendenhall Glacier, where we could spend as much as time as we wanted to, and took another shuttle back to our cruise ship whenever we were ready to return. The glacier and waterfall were stunning! We greatly enjoyed our trip. Weather turned out clear, saw numerous whales and even sea lions. Our tour guides were fun, engaged, and very knowledgeable. We recommend this tour to others.